Since the Grand Canyon National Park was closed, the folks at the Jacob Lake Inn provided us with a hand-sketched, not-to-scale map of a 30+ mile un-paved and mostly un-marked single lane route to a location outside the National Park boundaries where one could view the Grand Canyon from its north rim. Due to road conditions they estimated it to be a 3 hour round trip. We considered this excursion, but I really did not want to beat up the wagon’s suspension for that length of time. 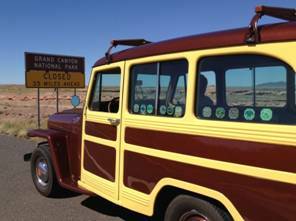 We elected instead to take the 120 mile trip down to the south east entrance of Grand Canyon National Park; the entry point of the 1920 Park-to-Park tour group. The major difference is that while the Park-to-Park tour group was cordially invited in to the Park and provided lodging at the 100-room El Tovar Hotel on the Canyon’s south rim, we were greeted by signs clearly indicating that we were not welcome to proceed into the Park. We, having anticipated this, took a few photos to document our presence and headed up to Page, Arizona for our evenings stop on the way to Mesa Verde – where we anticipated receiving the same rebuff. Fortunately, we had previously been to the Grand Canyon. For our 25th wedding anniversary (I’m trained to say “seems like yesterday”), Jean and I had taken a 7 day rafting trip down the Colorado River through the 250 mile length of the Grand Canyon. Of course the canyon was much shallower back then. With the final length of direct path north (AZ-89) from the south rim of Grand Canyon National Park to Page, Arizona being closed, we were detoured onto a temporary route (AZ-89T). While fueling up for this leg we inquired as to the condition of this temporary route north – this is very desolate territory. We were assured that with the exception of the initial short climb to the top of the mesa, the ride would be smooth and effortless. That was in fact the case. 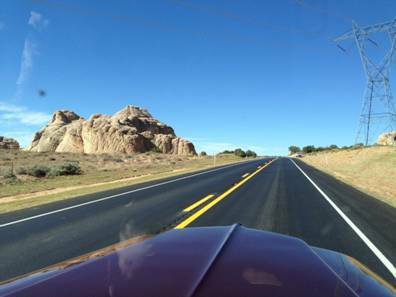 They had apparently recently re-paved the road in anticipation of closing the primary route. This temporary route was lightly traveled (we always worry about holding up faster drivers), and being on the top of the mesa, provided some excellent views of the surrounding terrain – another prime example of the road less traveled. We arrived in Page, Arizona a couple of hours before sunset. I refer to sun time because as in other areas of the central west one cannot be sure of clock time. The hotel had two clocks on the wall set an hour apart – one was local (Pacific Time) and the other was some other local time. We unloaded the Jeep (which at this point in the Trek means scooping up armfuls of loose belongings along with a total of 5 computer and travel bags – so much for strategic packing.) The folks at the Powell Museum/Visitors Center provided a hand-drawn map of local sites. 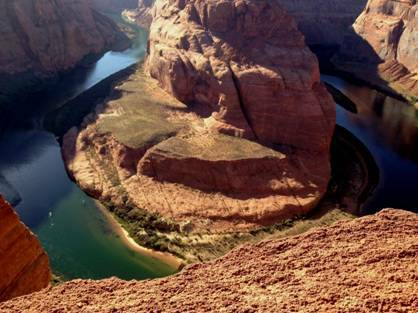 With the sun falling in the sky (we do not like to drive at night due to lack of side marker lights), we first set off for Horseshoe Bend lookout which provides a breathtaking (literally for acrophobiacs like myself), views of a very tight u-turn in the Colorado River. It was a good ½ mile walk to the edge of the canyon from the parking lot, and as we neared the rim I felt my joints stiffen up and my breathing shorten. I managed to get within 10 feet of the edge to take one photo of the river bend below; all the time being certain I would at any moment be flung by some explicable force over the edge never to be seen again. Fortunately, Jean and I had been getting along reasonable well at this point (at some other times also), so I was quite sure she was not to be source the force shoving me over into the abyss. We made the trek up to the parking lot to retrieve our Jeep and headed over to the site of the Glen Canyon Dam, which, although smaller than her sister Hoover Dam a few hundred miles downstream, was still very impressive to view. The Visitors Center was closed due to the US Government spending cuts; however, the parking lots and viewing points were still accessible. I wonder if they are still funding the guy who stands ready with a freshly masticated wad of chewing gum to plug any leaks in the face of the dam. We had a nice meal at a local American Indian run Italian restaurant and retired for the evening. to find high-quality writing like yours these days. Enjoyed catching up some via the blog on your journey and glad to see you are still having a great time. 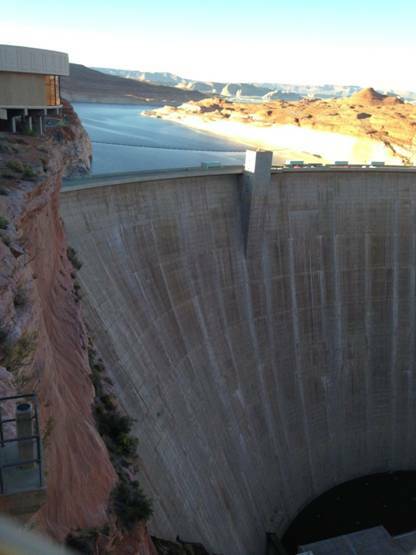 Nancy was excited to see Glen Canyon Dam. She remembers going there a few years back (at around 8 yrs old). Glad to hear all is well. We’ll have to get together for your photos and our’s (Italy). Glad to read all is going well despite the government’s meddling! Just glad you got so many of the parks under your belt before the shut down kicked in. I was in Prescott, Az last week. Beautiful state!